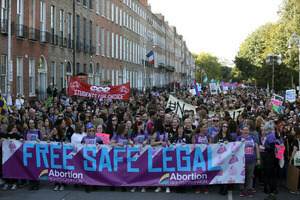 The seventh annual March for Choice, organised by the Abortion Rights Campaign,from the Garden of Remembrance, Dublin 1 to Merrion Square , Dublin 2. 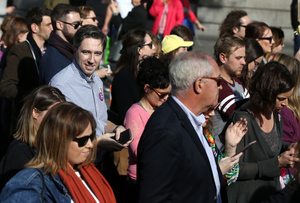 With politicians and pro-choice activists, including Minister for Health Simon Harris (pics 5 and 6), Minister for Children,Katherine Zappone (pic 2), Amnesty’s Colm O’Gorman (pic 3) and Dr Peter Boylan, former Master of Holles Street Hospital (pic 2). 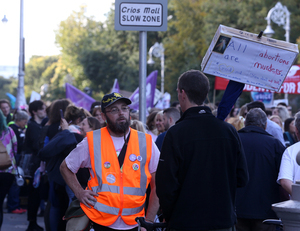 A pro-life protester is blocked by security from the pro-choice rally in Merrion Square. Turned Out Nice X-Rated Tay You Say? Free Saturday? 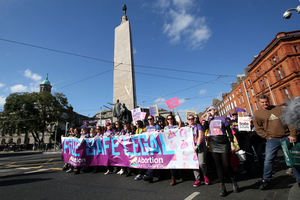 Posted in Misc and tagged Abortion Rights Campaign, March for Choice at 9:45 pm on September 29, 2018 by Bodger. You didn’t explain the motive for this protest. I believed we had a referendum on the matter which was an overwhelming yes. Is this for the North? Background info please. 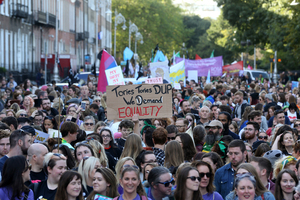 It seems to just be an on-principle kind of shindig, they’ve gotten used to it and they already had the signs so they figured they’d have a good march and a good day out and a bit of a laugh. The 8th has been repealed, but that doesn’t make abortion legal. 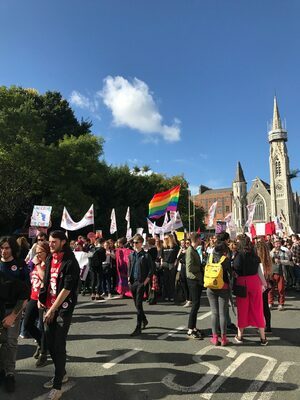 We marched today to make sure proper, workable legislation is put in place as quickly as possible and Irish women no longer have to travel abroad for healthcare, no longer have to prove they’re not pregnant or no longer wait until the balance of probability tips in favour of dying before treatment is mandated. Only lying harpies and useful idiots claim otherwise. Only ignorant simpletons would say otherwise. Abortion destroys human lives… that’s the intention, the focus, the outcome. At least 50% of all human lives destroyed by Abortion are female. 100% of the lives saved by abortion are female. If health care is what you are truly interested in then the appropriate legislation is already on the books. No further action necessary. Considering the eighth was repealed and they’re legislating for safe, legal abortion as voted by a MAJORITY of the voting population, I rather think it’s you who needs to accept that rather than us accepting abortion is the murder of my innumerable unborn babies. As we hashed out in minute detail during the ref, women are very well aware of what abortion is all about. As you said yourself. Game over. Go home. This is modern Ireland and you won’t shame women out of making the right decision for them, whatever it may be. Where did I say I was interested in healthcare? What’s it to you anyway-it’s none of your business. So now you’re saying abortion is not heatlhcare? Get your talking points in line. If your abortion is none of my business then don’t expect me to pay for it through taxation. That’s not how taxation works. For example, I’d hate to see MY hard earned money going towards your cosmetic scrotum surgery but sadly, that’s not how life works. You need that scrotal surgery and taxes – mine, yours, great uncle seamus’ – all pay for it. That’s how it works. We all pay our bit and society as a whole benefits. That doesn’t mean you get ANY say in anyone else’s bodily autonomy. Sorry. My taxes go towards plenty of things I don’t like but I still pay up because that’s what being an adult is. And I’m pretty sure I made this point to you before but I reckon you ignored it because there’s no easy rebuttal to it. Stop carrying on like a three year old who didn’t get his lolly. Notwithstanding your rather strange fascination with what may or may not be between my legs you’ve just compared abortion to cosmetic surgery. Your interest in what I may or may not be growing in my uterus and what I choose to do with it is equally creepy so perhaps we understand each other now. The point is, my taxes, your taxes, everyone’s taxes will be put to use in some way that we won’t agree with individually. It doesn’t matter what medical procedure my taxes or yours are spent on, it’s still none of my business and it’s none of yours either. If you have an issue with that perhaps look to the States as a preferable place to live. Oh I see… we’re comparing babies to cancer now. Any anybody who doesn’t go along with this Social Justice Warrior nonsense has to leave the country. The left want the purity of their ideological dominance at all times. No questions asked. The ideological dominance of the RCC meant people had to leave the country to get basic healthcare. Thankfully the Irish people have matured enough to deal with the real world, instead of obsessing about a fantasy one. No. I’ll spell it out nice and simple for you since reading comprehension clearly isn’t your strong suit. A baby is a foetus which has developed to a point where it can survive independently of it’s mother. Cancer is an illness. Both can be life threatening. It’s not actually your job to decide which is more important. The medical procedure for removing say, a benign uterine pollup is actually more invasive than a d&c, or taking pills to induce a miscarriage. Again, it’s not your job to decide if a woman is more or less deserving of one or other of these treatments. No one should be made account for their healthcare decisions. Channelling the Archbishop there Cranky? That’s pretty much the pro life mantra right there in a nutshell, sweetie. You Alansky bots are all the same – projecting your own evil motives on to any opponent who dares to challenge your POV. If you say your abortion is none of my business then I say fine – just don’t expect me to pay for it. Else you’re a bunch of satanic communists. Lol I’m a bot, am I? Take a seat. Fine you don’t have to pay. Not personally, anyway. Your taxes, however, will. Haven’t you read your bible Cranky? Jesus was a communist. Take responsibility for your own actions; It’s the sign of an adult. Expecting others to bail you out of your own mess is childish. Pay for your own abortions – it’s the least you can do. Don’t involve me in your act of murder (your word, not mine). I will pay my taxes like an adult, and the healthcare system which I help to fund will offer me the healthcare I require, including abortion. That’s called being an adult. I’m sorry it’s so hard for you to understand that. It explains why you fall on the old “Bot!” insult when you can’t manage to make a compelling argument. Abortion is the opposite of maternity care. Abortion is the opposite of health care. But you all know that and you don’t care. Your lefty blood-lust demands that innocent, unapproved children must be killed. And everybody must forced take participate in this pogrom because if everybody is guilty nobody is. And without irony the exact same shrill voices who cheer this execution of the unborn will piss and moan about how the church behaved 40 years ago – even as they themselves are guilty of much worse. There is no apparent limit your hypocrisy: Repeal the Eight was never about health care, all you lying loony lefties care about is control of hearts and minds so you can lower everybody to your own lack of standards. Pay for you own abortions. Aaaaaand we’re back to the old testament stuff. We’re done here. I’m not bothering with sheer stupidity of you. I spent enough of my time doing that in May. Nobody mentioned the old testament. Pay for your own abortion. It’s the least you can do. Sadly we don’t award points for stupidity, no matter how prettily the words are alliterated. Thought you were done here Millie Murder? If abortion is healthcare then the legislation is already on the books. Unless abortion isn’t about healthcare afterall and you have an ulterior motive that needs more direct support from the parliamentary process? Could your abortions now be a for-profit enterprise? That’s why you want tax-payer funding – the guarantee the revenue stream. You don’t care about women’s health, it’s all about the bottom line. You’ve got me twigged for sure. I want a massive industry where we use the hidden power of innocent foetuses to fuel the cars of the future. Get a grip, buddy. What I want is what I have always wanted. 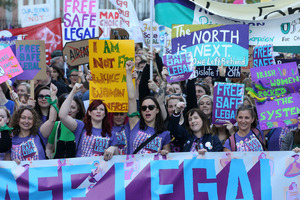 Legal, safe, free abortion. Beyond that, I think you genuinely need to get some help because the stuff you come out with here is neither reasoned not even close to sane. But that’s another story. You’re the one with murder in your username. You keep peddling the lie about abortion as health care when you know that’s not really true. You keep saying you’re leaving yet you don’t. And I’m the crazy one? Ooooh i used the word MURDER in my online name therefore I AM A MURDERER. Call the guards. Help. Police. Save us all. I said it once btw, but you know what? I changed my mind. Trolling you is much more fun. What a mature and rational attitude. Should tax payers money fund an independent free thinking woman’s “choice”? Abortion should be funded by the woman having the abortion, any state provided treatment should be done on a basic means tested basis. 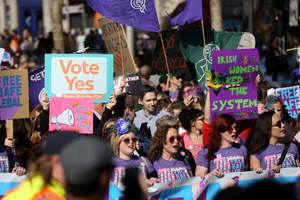 The eight amendment needed to go but now we have a movement that won’t stop until everyone has been brow beaten by the right on cutting edge that drives it. When it comes to these people we’re all free to agree with them or else. Should tax payers money fund any number of the elective surgeries which take place across the country? Yes, because they are tax payers who contribute to our healthcare system. Why should this be any different? Because it offends your sensibilities? That’s not enough of a reason. Harris, like some insincere ghoul in the crowd. someone has been at the absinthe. …yeah lets see the legislation that he’s slow walking,the vote was in May ! FFS. Did you miss the high court challenges? The 8th was only removed in the last fortnight and the Dáil’s been on recess since May. The legislation is coming, have no fear on that. 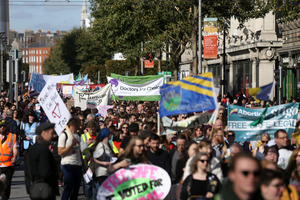 are you naive enough to think that TD’s write legislation ? Colm O’Gorman is turning into Sean Connery. WHY? 008th? I am appalled at what the false religion of Militant Feminism has achieved. They have neither a brain nor a heart between them. It’s all about “Me! Me! Me!” nowadays. 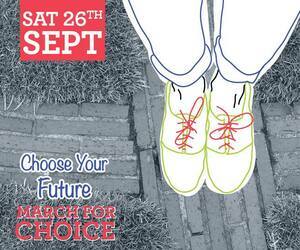 MY body, MY life, MY right-to-choose… WHERE did they get this from?? I pity the children they CHOOSE to give birth to – every bit as much as i pity those children they choose NOT to give birth to ,”( abortion – the murder of the unborn – is an abomination. No two ways about it. I will not vote for ANY politician who thinks abortion is “right” it is NOT right. So there!! What’s it like going up against Billy Goats Gruff? I can assure you they couldn’t give a flying hoof what (meagre) qualifications you have. Well that’s us told. But look, Devotions are at half five this evening. Between that and a few masses this morning you might feel a little better then. But if you want my advice, take it easy this morning, make rasher and egg blaas an’ a pot of tae for the breakfast and just breathe. You can’t change what’s the people have voted for. I’ll tell you where women got this from ‘Mary’… years of being slaves to their bodies and suffering as a result from a church who hold them in contempt and still has no regard for them. If they had their way abstinence would be our only form of contraception and women would resort to mustard baths in the hope of inducing a home abortion. Mary, Mary, Mary, unclench the pearls, pet. You’re cutting off air and blood to the brain. Were we shrill too, d’ya think? I’m looking for a full line on antichoice buzzword bingo… Don’t let me down! 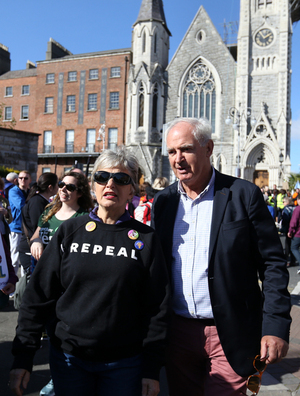 On the run-up to the vote there were regular pronouncements that the Repeal campaign were doing it wrong, they were going to lose, they were only appealing to their own echo chamber. Perhaps, just perhaps, they have earned the benefit of the doubt that they know what they’re doing, and anyone looking for real substantive change and reform in our political system would do well to learn from them and win them over and work with them. No number on the security goon, probably just as well when you attempt to force people off the public footpath.He may even have a balaclava in his arse pocket, for the next gig, maybe. Women, always moaning. haven’t they already gotten this? are you the new Jimmy Russle ? worse: he’s the new Cranky Pants/newsjustin- I can’t tell the difference, they’re both bores. Cranky pants is our very own sentient won, resident antichoice loon from last may. We may see a.little more of its ramblings until the legislation is passed. Think of it as the last desparate moans of a dying, irrelevant troll. Your stand-up was undoubtedly better. 11 comments on the Tuam photos, 70 on the march. The trolls don’t care about life or children, only about telling women they’re harpies. Plenty evil-wishers on this thread! Hanging… Just one point before I abandon ye to ye’er fate: a baby is not a parasite. They don’t “take from” us, they “share” with us. Our own life is a gift that we did nothing to deserve. Where did WE get the right to end another’s life? Think before you spit your answer at me!! Slán Mary. Níl aon broinn mar do bhroinn féin.